Among fans of Formula One, the name Michael Schumacher is spoken in hushed, reverent tones, for it belongs to a man who, even in this modern age of hyperbole, can rightfully be called a racing legend and,possibly, the greatest driver of all time. Active from 1991 to 2006 and again from 2010 to 2012, the German driver won seven Formula One (F1) World Championships, holds the record for most victories (91), and in 2002 became the only driver in F1 history to finish in the top three in every race in a season (breaking the record for most consecutive podium finishes concurrently), among other accomplishments. It is unsurprising,hence, that he was approached by Omega to become a brand ambassador for the Swiss watchmaker, lending his name and influence to a series of special editions of their iconic Speedmaster lineup.Even though no longer produced, fans of the series will find that on the second-hand market, these watches represent excellent value compared to other lines of used Omega Speedmaster watches and are an excellent way to combine two passions into one: racing and watches. In 1996, the first version of the Omega Speedmaster Schumacher was revealed by Mr. Schumacher at his go-kart track in Kerpen, Germany. It came with a choice of either a red or yellow dial (celebrating Mr. Schumacher’s first year driving for Ferrari) and a choice of either a red or yellow leather strap or stainless steel bracelet. 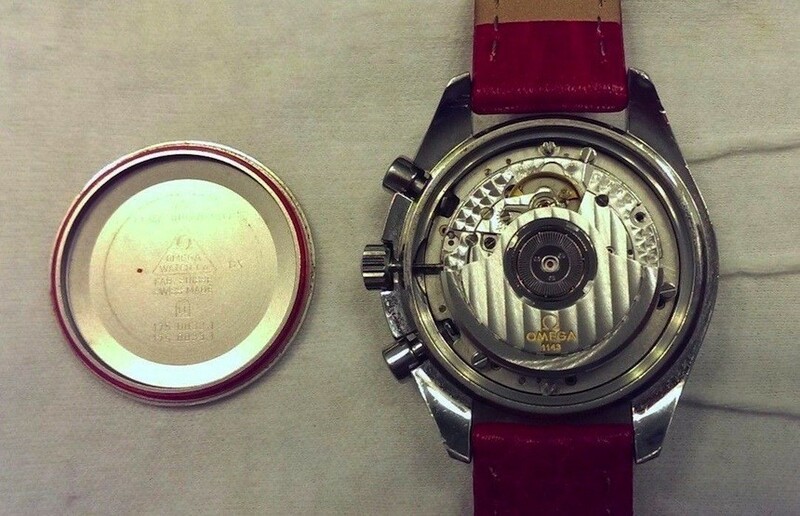 The case measured 42mm with the crown and 39mm without (this sizing remains consistent throughout the editions). 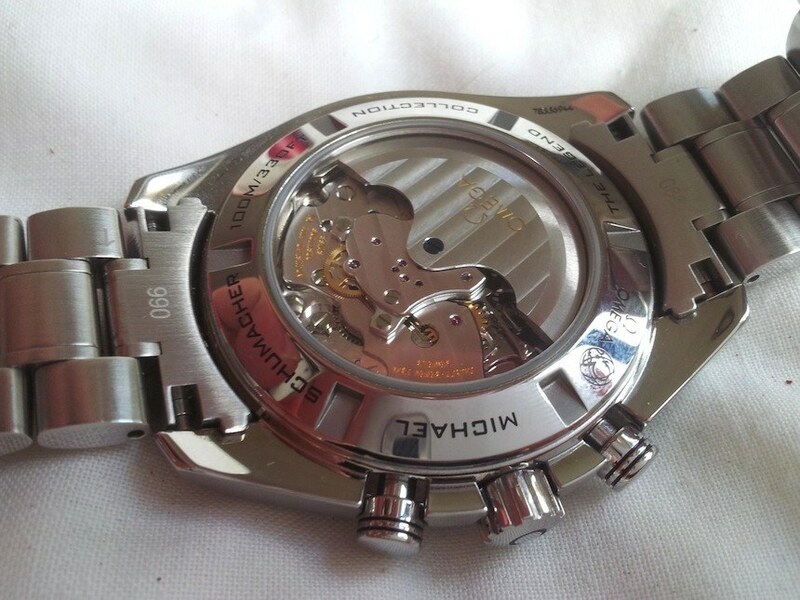 Interestingly, the movement’s serial number was stamped on the outside of the rear cover and not on the movement itself. 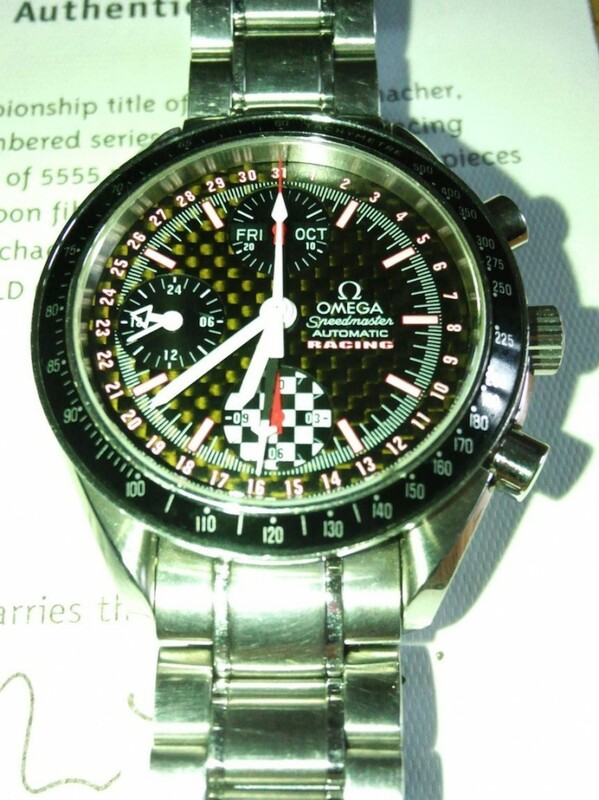 Following the first Omega Speedmaster Schumacher came the Omega Speedmaster Racing Schumacher World Champion 2000 Limited Edition. This watch was numbered and limited to 10,000 pieces, of which 6,000 had a black dial and 4,000 had a white dial. The watch featured the word “Racing” above the sub-dial at the six o’clock position and had red and orange checkered markings around the outside of the dial. It too had a snapback case,nevertheless unlike the previous edition, did bear Mr. Schumacher’s name, which was engraved into the back of the case along with his signature and the production number. It came with an option of either a stainless steel bracelet or black leather strap and had an Omega 3220 movement. 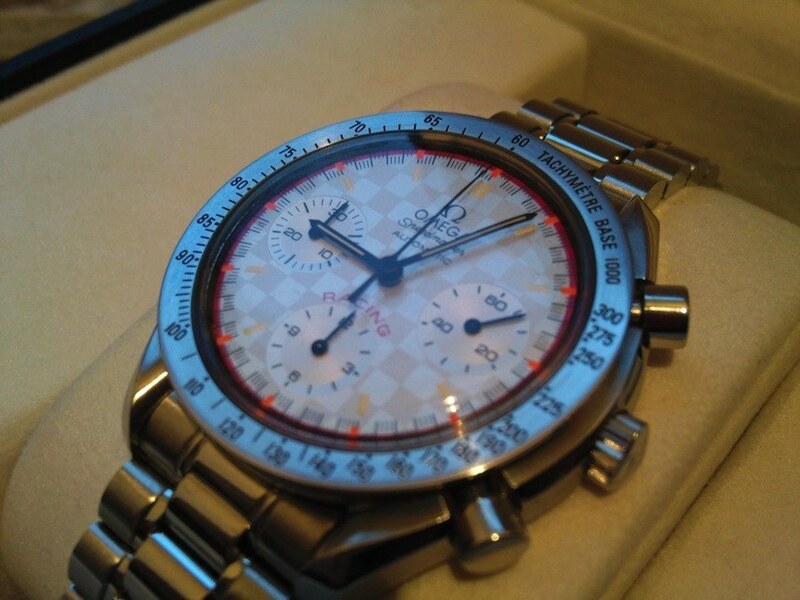 Named the Omega Speedmaster World Champion 2002 Schumacher Limited Edition, this edition was numbered and limited to 5,555 pieces. It featured a sapphire crystal and a carbon fiber dial and the word “Racing” appears below Omega branding text at the three o’clock position on the dial. The watch had an Omega 1151 automatic movement and was most famous for its day wheel. Monday through Saturday were displayed on white backgrounds,nonetheless Sunday, aka race day, was red. A reminder for any forgetful fans that it was time to tune in to the day’s pageantry. In 2002, Mr. Schumacher won his fifth world championship, tying the record of Argentinian racing legend Juan-Manuel Fangio whose last world championship came in 1957, a full 46 years earlier. 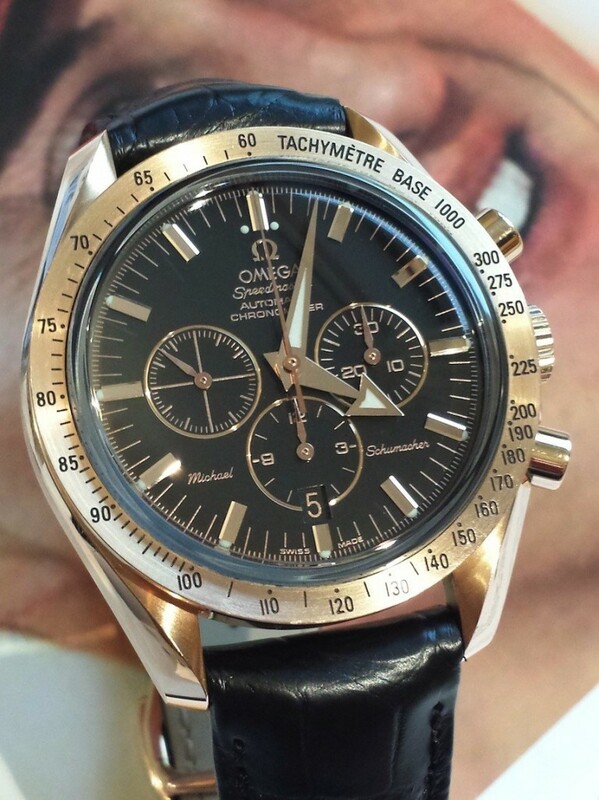 The Omega Speedmaster Broad Arrow Michael Schumacher, cased in 18kt rose gold with choice of matching bracelet or black leather strap, honored this achievement in 2003. 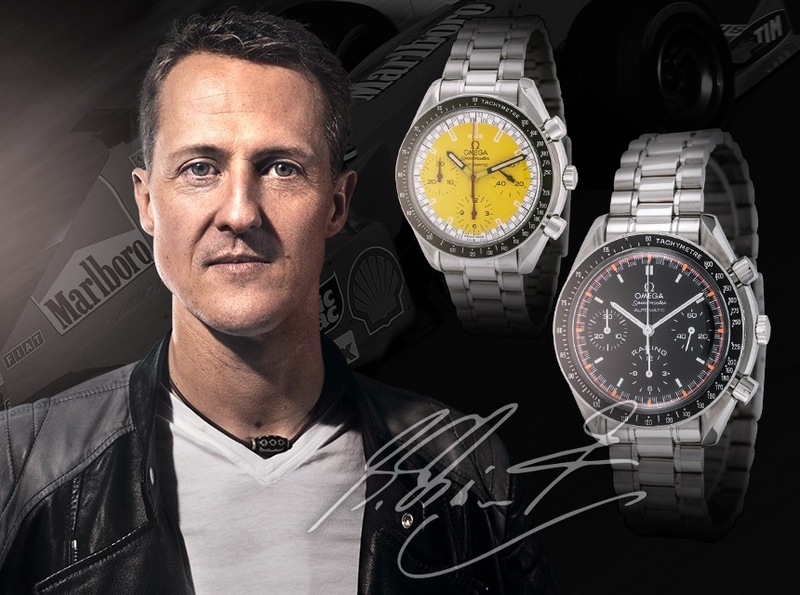 Engraved into the case was “Michael Schumacher – Five-Times World Champion.” It had a black dial and sapphire crystal and featured the Omega 3303 automatic movement. This was the first watch to feature Mr. Schumacher’s name on the dial itself, a fitting rise for prominence on the watch that was mirrored by his racing career. With Mr. Schumacher’s final title came the final Schumacher Speedmaster, the Omega Speedmaster Legend Limited Edition.With ease,the watch is distinguished from the rest with its first seven hour markers being taken place of numerals, counting up the number of titles won, all set on a subtly checkered carbon fiber dial. It is powered by an Omega 3313 movement and features a crystal display back, allowing easy viewing of the heartbeat inside. Around the bezel are listed all of Mr. Schumacher’s accomplishments: seven world titles, 250 F1 races, 68 pole positions, 91 victories, and 154 podiums. A well thought out and classic tribute to the legend. 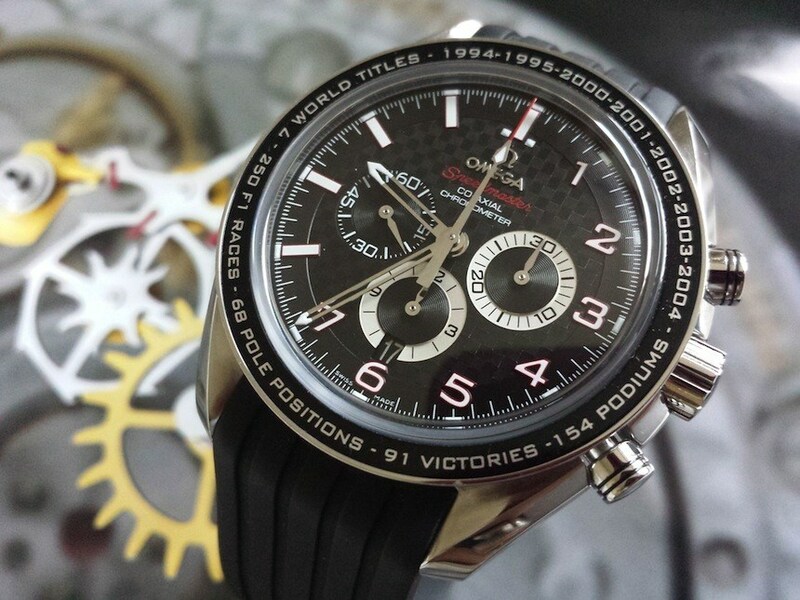 If the volume available is low, one highlight in regards to buying these watches on the second-hand market is that compared to other series in the Omega Speedmaster line, the Michael Schumacher series sells on the low end. The average price from December 2014 through March 2015 was $1,495.11, with a high of $1,999.00, a low of $1,112.00, and a median of $1,635.00. 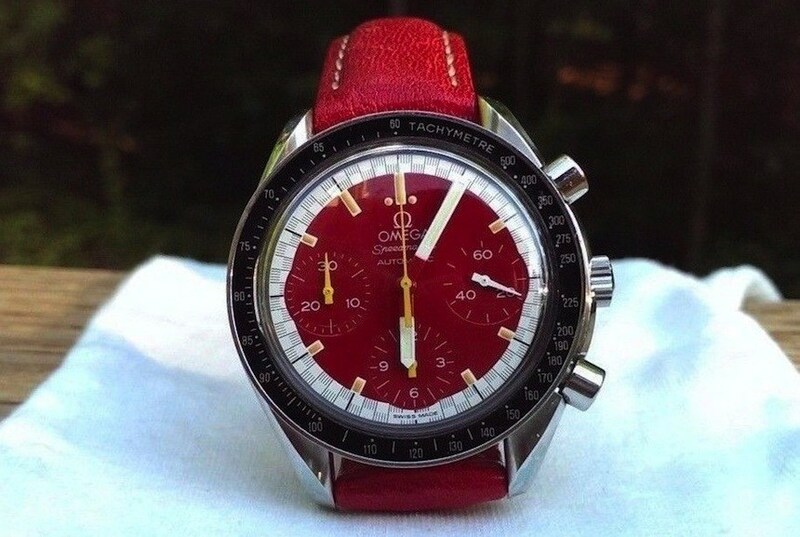 This is able to be compared to the Omega Speedmaster Professional, which has an average total cost of $1,927.06 and the Omega Speedmaster Olympic series, which has an average total cost of $2,327.67. As far as country of origin, 57% of the Michael Schumacher series Omega Speedmasters were sold by sellers from the United States. Interestingly, the remaining 43% were sold from sellers based in Japan, a testament to the combined global reach of the Swiss giant and the racing legend.